There were 702 press releases posted in the last 24 hours and 153,595 in the last 365 days. "We were making great strides towards a more inclusive, modern, business-savvy Ontario. Yes, it appeared I would be Premier of Canada's largest province by age 40. Instead, on January 24, 2018, I was all but assassinated in public. Who did it, how, and why? This is a story of betrayal, blackmail, and backroom politicking involving some of Canada's biggest political names. This was my dream, this was my nightmare. 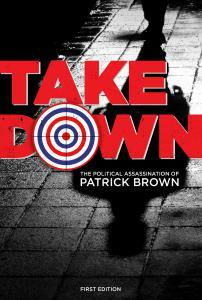 OPI is pleased to announce Patrick Brown's sensational new book that will captivate audiences across the country. From his precocious victory as Ontario Progressive Conservative leader in 2015; to his rebuilding of the antiquated party from scratch; to the suspicious speed of events leading to the early morning resignation as the party's leader; Brown will tell a story like no other politician has, in a cultural moment in time like none other in history. The book is scheduled to be in stores by November 1, with a full media and book tour. National newspaper and magazine syndication is expected. Options for theatrical rights are currently available. Please contact Dean Baxendale. The Canadian Connection, 1976 by Jean-Pierre Charbonneau. Montreal underworld: Beyond Reason by Margaret Trudeau, French Worldwide/ Global Syndication in French and English Up the Hill 1986 and Bullet Proof Flag with General Beatty 2007. Optimum is also launching Bad Blood, The Unspeakable Truth, by Vic Parsons this Fall to coincide with an eight-part docudrama, Unspeakable to be aired on CBC and Showtime in Canada and Sundance TV USA. Both books are distributed in Canada by Georgetown Publications. Contact Rob Dawson at 905-702-7099 or e-mail or speak to your local Georgetown Sales Representative.